Meet Sarah Willey, Director of Development at Great Rivers Environmental Law Center and my new fundraising hero. She’s out here fighting for Missouri’s environment while showing off her donor communications skills. I don’t know why she attended one of my recent webinars on donor retention (because she should be the one teaching), but I thanked her for a shout-out with an online donation (I’ve got a soft spot for environmental causes). Your online giving provider is going to send something like this out; cold, transactional, impersonal. The problem nonprofits run into is when this is the only thing that gets sent out. Even if you customize it (which you should) it’s still going to be just an automated email with certain limitations. Most donors won’t consider it be an actual gift acknowledgement. The personal follow-up cleanses the robotic taste in my mouth and sets up future stewardship. This is also a nice alternative to phone call when a phone # wasn’t given on the form, or something else is preventing you from calling (like bandwidth). A few days after the emails, I received a welcome packet by email. I was expecting a somewhat templated letter, but what I got really blew me away. Thank you for your first gift! Without you, citizens in our region would not have access to free and reduced-fee legal services when they see that their health and environment are in jeopardy. Thanks to you and other generous Friends like you, there is a local legal resource to combat climate change, dirty air and water, and environmental injustice. Your support protects local parks from development, defends the rights of our neighbors to grow sustainable gardens, stops businesses from emitting harmful pollution, drives for more renewable sources of energy and better energy efficiency, and so much more. We will update you on how your gift impacts the community through our annual newsletters, and I invite you to connect to us on social media for real-time updates. If you have any questions or feedback, please feel free to contact me or our Director of Development, Sarah Willey — we love to hear from our Friends, and welcome your ideas. Thank you so much for your donation of $20.00 on 8/5/18. Your gift is tax-deductible to the extent that the law allows. No goods or services, in whole or in part, were provided in exchange for this contribution. 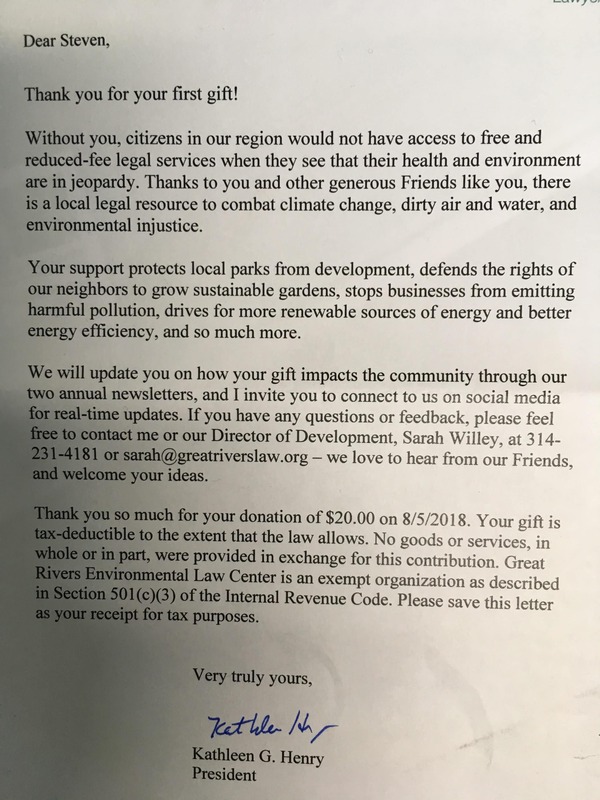 Great Rivers Environmental Law Center is an exempt organization as described in Section 501(c)(3) of the Internal Revenue Code. Please save this letter as your receipt for tax purposes. The letter contains a whopping 15 “you” words and only 2 “we” words. It puts all of the spotlight on the donor, and only references the org in terms of what it will do next for the donor. It also passes the Flesch-Kincaid Reading Level Test, coming in at an 8th-grade reading level (between 6th and 8th grade is ideal). Thank you again for joining our friends as a new donor. I’m so touched that you looked us up!. I enclosed our most recent newsletter so you can read up on the impact of your support. These 40 words are masterfully written. It kills me that more orgs don’t send one out regularly, while instead favoring email newsletters. The print newsletter is such a lost art, despite it being a confirmed money-maker. This one chock-full if impact stories, donor stories, volunteer profiles, remembrances of past board members who have passed away, legislative updates; juicy stuff that gets supporters fired up! I love the fact that it was included in the welcome packet since, depending on the timing of the gift, it might be months before the next issue reaches my mailbox. This jump-starts the storytelling process. If you want to get started, watch this excellent webinar from newsletter expert Steven Screen. While a thask (a direct ask in the gift acknowledgement itself) is ill-advised, including a reply envelope for future gifts has been shown to be successful. The idea is that it makes it easy for a donor to send a gift by mail should something like a stewardship piece move them to do so. There’s mixed opinion on this practice that you can ready about here, but for what it’s worth, I like it in this case. Want to start building a personal relationship? Include your contact info. Don’t extend an invitation to ask questions and provide feedback without including your contact info (done twice, in this case). Plus, dropping in a business card (and multiple items in general) makes it look like this packet was assembled by hand. What do you think of this new donor welcome packet? Let me know in the comments below!